Found it by the stream in the back garden. We often find small fossils, ammonites and sea fauna. 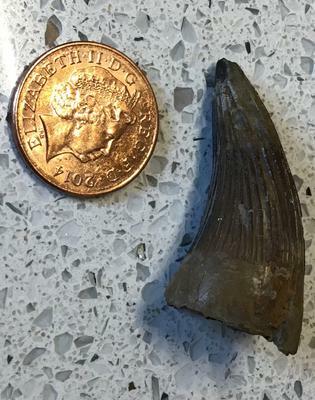 Please help us to identify this fossil. Comments for Possible Dino tooth? This does look like some kind of tooth. Sorry I can't tell you what species. The groves are unusual and may give someone the clue needed to id this specimen.